We're proudly home to three of the fastest land animals in the world - the cheetah. Its slender, long-legged body is built for short burst of high speed, with its tan fur with black spots camouflages them perfectly. The running heartbeat of a cheetah can go up to 125 beats every 30 seconds in comparison to a human, which is 94 beats every 30 seconds. Cheetahs can be distinguished from leopards and Jaguars by their distinctive "tear marks" that stretch from the corner of the eye to the corner of their mouth. These tear marks are believed to help stop sun reflecting into their eyes, effectively aiding in hunting and seeing long distances. Cheetahs cannot roar but purr, and they are also typically solitary animals. While males sometimes live with a small group of brothers from the same litter, females generally raise cubs by themselves for about a year. 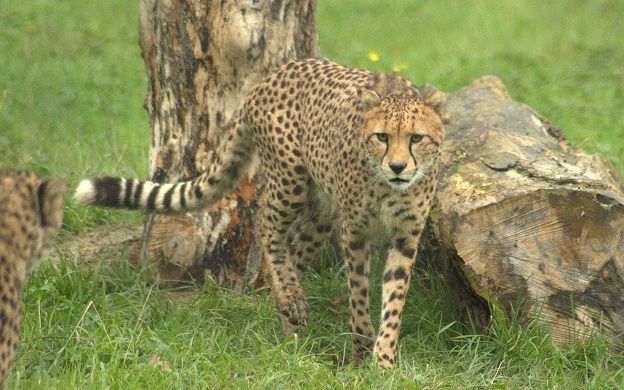 Wild Place Project is one of only four collections in the UK to keep the central African cheetah (scientific name: acinonyx jubatus soemmeringii). Learn more about our cheetah at the keeper talks! Check out the 'What's On' board upon your arrival for cheetah talk times. Cheetahs are carnivores preferring medium-sized prey. In the wild, cheetahs concentrate on individuals that have strayed some distance from their group and opt for young and adolescent targets, perfect for their style of hunting. Central African cheetahs are found in the central and north eastern regions of the continent and in the Horn of Africa. Cheetahs inhabit dry and open areas, such as deserts, savannahs and grasslands, scrubs and light woodland. Cheetah are listed as vulnerable by IUCN. There are around 10,000 cheetah in the wild, with less than 2000 central African cheetah in the wild. They are facing various threats including loss of habitat and prey, conflict with humans, the illegal pet trade and a gene pool with very low variability. The cheetah does not adapt easily to new environments and is poorly equipped to defend itself against other larger predators. You can learn more about the cheetah's conservation status on the IUCN Red List of Threatened Species website.